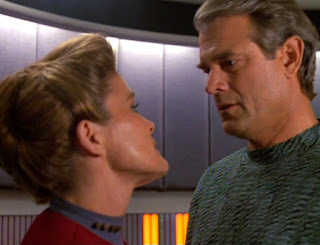 So this is the one wherein Janeway's holo-hunk starts getting really kissey-kissey with her and I can never remember if the whole "Janeway in a Gothic Novel" plot actually goes anywhere or not. Every time they show up again, I feel like it's the last time. I guess I'll just have to wait (hopefully not for too much longer) and see. 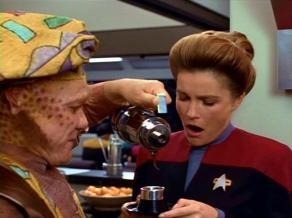 Anyway, the Voyager crew runs up into some space wherein Janeway keeps getting the sensation that something super odd is happening. Tea cups and smooching are involved. Then, it happens to everyone. The whole crew begins to see representations of the folks they left back home and it's not long before Voyager is just about dead in the water. Lucky for the crew (and bad for the aliens trying to take over) the ship is also manned by a holo-doctor and a super psychic two-year-old. Persistence of Vision is essentially a showcase of the inside of every character's heart. It's the kind of sci-fi idea that plays quite well in Trek because it gets at something very real through something that toes the line between goofy and creepy. This one tends to leave me thinking about who I might see if I were stuck a quadrant away from home. Obviously, I'd see my husband. I'd like to think I wouldn't have left him back on earth like a chump but he wouldn't even need to be that far away. B'Elanna fantasizes about a roll in the hay with Chakotay (for some reason and I'm really glad they stopped that) and he's just a couple decks away. So, I think, the actual premise is that it's about what you want most, and how that can be a distraction. Certainly, Scott and I distract each other. For the last eighteen months or so we've both worked at home and we're both writers. We help each other flesh out stories, pull out the snags in our plots, poke holes in each other's arcs, and offer up ideas on a near-constant basis. Today, though, Scott started a new job that doesn't involve him being home with me twenty-four hours a day. It's just me and Bunny. And it's a little strange. I never get lonely and I never get bored. It's not that. I always have stuff to do--too much, actually. And it's not that I don't have someone to talk to--I talk to myself a lot (like, really a lot, like... in the grocery store) but it is rather strange to turn around and he isn't here scribbling away on a notepad or watching something for research or shuffling cards. So, I guess what I'm saying is this: If a malevolent alien, knowing exactly what I want, decided to show up here today and try to convince me to stop working on my various projects, I suppose he'd show up as Scott and say, "Hey, let's take a walk and talk about our stories," it would work. Because, even though I curse and roll my eyes at Janeway every time she's taken in by the facsimile of Mark in the turbo-lift, I realize today I'd do exactly the same thing.